With the release of my latest appliqué pattern, the fast and easy Christmas Appliqué Set, I want to revisit the topic of the Quilt-As-You-Go Method. Previously, I shared some of the basics of this technique which simplifies the quilting process and makes it attainable for all skill levels. In my first post about the Quilt-As-You-Go Method (QAYG), I showed how to apply it to a simple appliqué project; in this post I want to provide a tutorial in order to thoroughly explain the process so you can apply it to your own quilting projects. I’ve included this short video which quickly demonstrates QAYG Method #1. Below the video you’ll find tutorial instructions to help you better understand the entire process. The Quilt As You Go technique (QAYG) is a way to quilt blocks before putting a quilt together. It simplifies quilting for beginners because it is an easy way to join quilted pieces by machine. 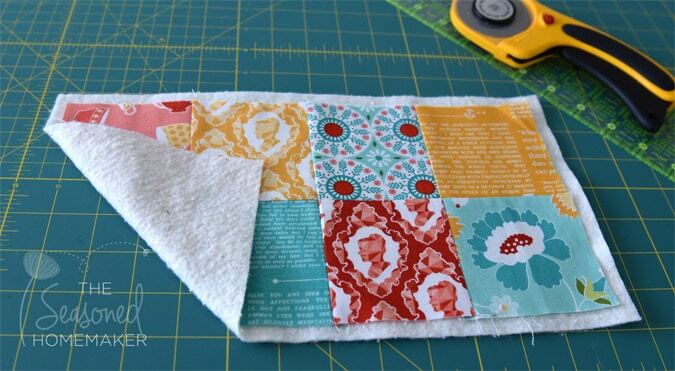 Instead of handling bulky quilts, you can quilt your project one block at a time. Quilt-As-You-Go is ideal for machine appliquéd projects because quilting over the applique design can cause skipped stitches. It’s also great for people who don’t own a larger sewing machine with a wide harp. Because you are working with individual blocks, any machine that sews a straight stitch will work. This technique is also perfect for people with arthritis because they will not have to wrangle a large quilt through a domestic sewing machine. If you love to sew and quilt but don’t have a lot of time or space, QAYG is a great option because you are working with one block at a time. Your sewing space won’t be overrun by fabric and supplies, and you can easily cut, sew, and quilt a project in a very small area. 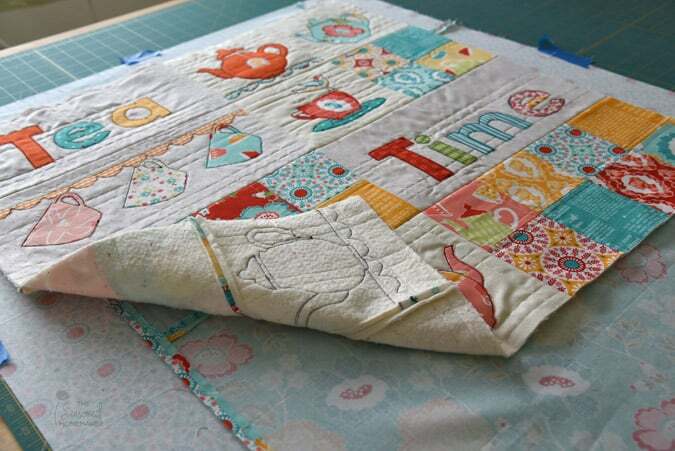 Quilting projects like table runners and baby quilts are ideal for the Quilt As You Go Method. 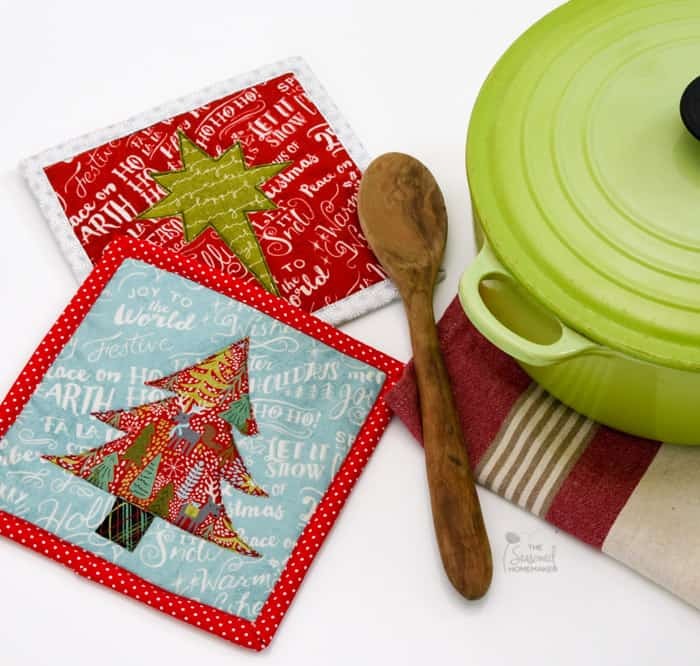 There is no sashing required and quilting while piecing makes these types of projects go together quickly. For anyone on a limited income, QAYG is the most budget-friendly way to quilt. You don’t have to send your larger quilts out to a longarmer; instead, you are able to do simple quilting, one block at a time. There is also very little waste with QAYG. You can purchase smaller amounts of batting or even use your batting scraps. Most of my Quilt As You Go projects take advantage of this. There are a few basic methods of QAYG which I will break down and explain in detail over a few posts. Today, I’m beginning with QAYG Method #1. If you love to machine appliqué designs onto quilt blocks then you will want to use this first method. When you appliqué a design using a fusible adhesive product you will have a difficult time with free-motion machine quilting. You may have skipped stitches when you try to FMQ over the design. Instead, it is recommended that you quilt the block first, then appliqué over the quilting. For this method you will need a quilt block and a piece of batting. It is very important that you use 100% cotton batting* that is low-loft and needle-punched because you will be pressing directly onto the batting with a hot iron. (*affiliate) If the batting has any synthetic fibers, they could melt when the iron is applied. 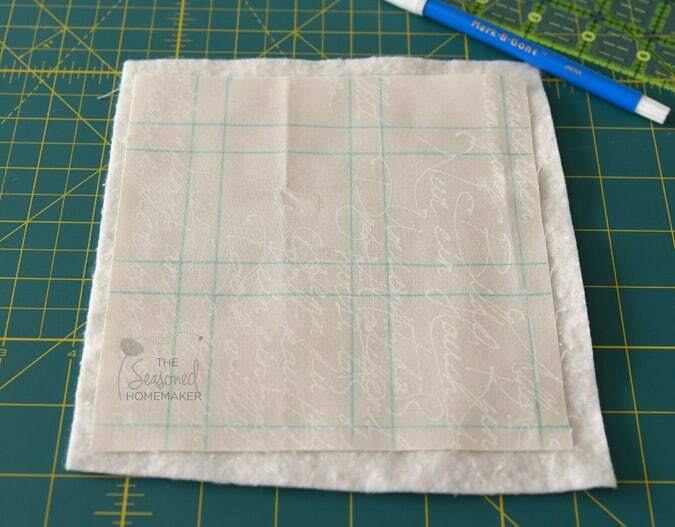 The block can be a simple background fabric that you plan to use for appliqué or it can be a pieced block. When preparing for appliqué I find that simple quilting is usually better than something complex. Depending on the appliqué design, you may want to get creative and make the design stand out more. Try some straight lines, wavy lines, or even some wonky lines. There really are no set guidelines, just use your imagination. There is no need to pin baste when working with smaller blocks. I do however have a super easy trick that works great. Elmer’s Jumbo Glue Sticks. (affiliate) Seriously, on a 12″ x 12″ block I will make three dabs across the top, the middle, and the bottom. Then, press with a hot iron to set it. Everything stays together nicely and nothing shifts. As long as you don’t over-apply, there won’t be any stiffness and it will wash out. One tip I’ve learned from experience, with larger blocks always start in the middle and quilt towards the edge. I would also recommend a walking foot for simple straight grids like the one above. 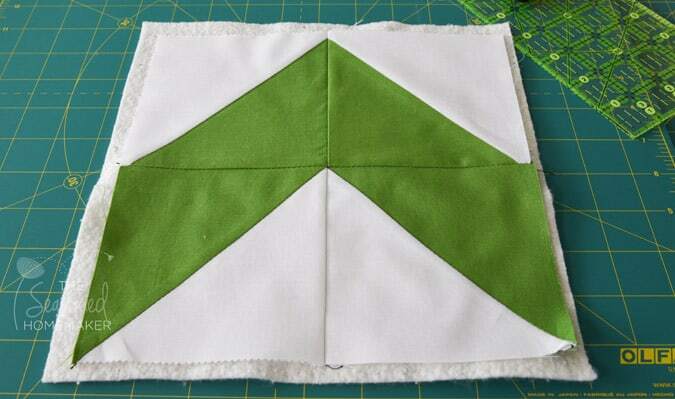 It is also possible to use Method #1 for a pieced block. Simply add 100% cotton batting to the back of your pieced block and dab on a little glue from your glue stick. It can be really fun to get creative and do some wavy lines or ruler work with simple blocks. Keep in mind, with this method the quilt backing comes later in the process. At this stage, you are quilting directly onto the batting and may need to think ahead to allow for the final quilting once the backing is attached. For something like the 8-patch block above I might do some quilting within each block using the QAYG method; but I would wait until the backing is attached to stitch-in-the-ditch quilt and outline the individual blocks. The quilting you see in the above photo will not show on the front of your quilt. 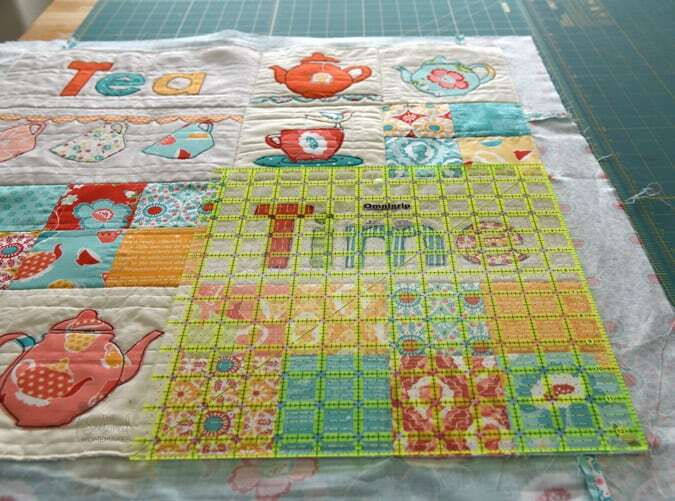 You will want to wait until the the blocks are assembled and your quilt is basted to the backing before you decide how to finish quilting the front. In most cases, stitching in the ditch is enough to secure the quilt front to the quilt back. There are some things to consider when using Method #1 for a QAYG project. Be sure to cut your batting a little larger than your project. If you plan to do some dense quilting, you may want to add a much wider piece of batting. For simple quilting (which I recommend for QAYG) the batting doesn’t need to extend too far beyond the quilt block’s edge. The next step in this method is attaching the blocks. Once all of the blocks are quilted and squared you attach them using a 1/4″ seam allowance. I recommend pressing open the seam allowances to avoid bulky seams. Adding the quilt backing is your next step. This would be a good time to use the glue sticks for basting the backing to the finished top. An added benefit to Quilt As You Go is the ability to easily square up the quilt front with the quilt back. 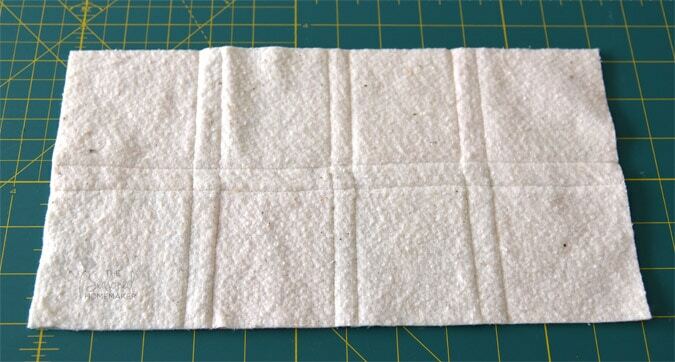 Because everything has been previously squared, all you need to do is square up the backing to the quilt top. From here it’s just a matter of some simple quilting to attach the quilt back to the quilt top. I tend to stitch in the ditch for most of my QAYG quilts unless a little added detail would improve the overall design. Bottom line – this is easy. All that’s left to do is bind the quilt. As you can see, Quilt As You Go works for both appliqué designs on a quilt and traditional quilt blocks. They key is sticking with simple designs. I made the quilt below using QAYG Method #1. I quilted the blocks individually before attaching them together. Once the entire quilt was assembled, I attached it to my backing by stitching in the ditch using an Edge Stitch Foot. 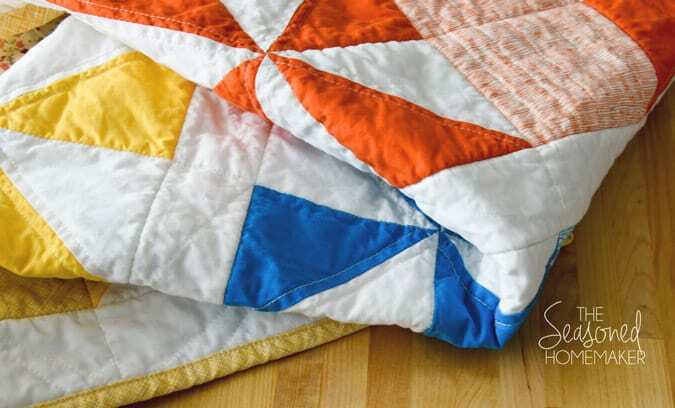 If you don’t have a ton of time, a lot of space, or a high-dollar sewing machine, you can still make amazing quilts. 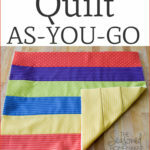 QAYG really is a great option for anyone who wants to create simple quilts for family and friends. Leslie, Thank you for an excellent tutorial! With your guidance, I think I can tackle a QAYG baby quilt! 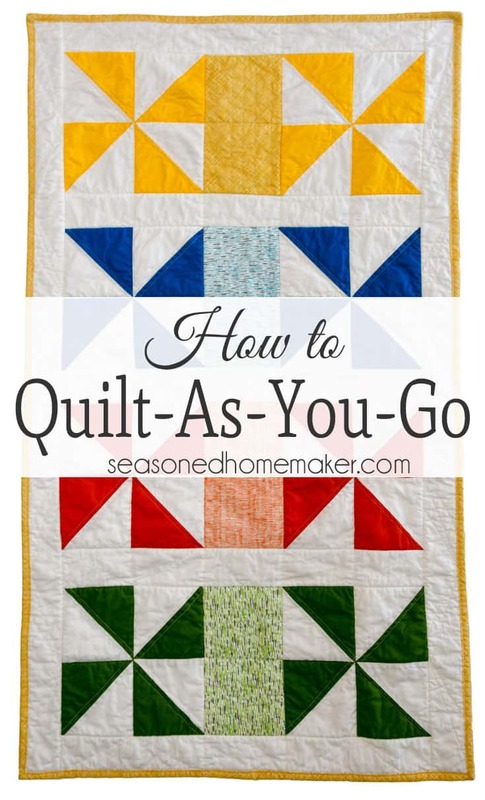 Love the quilt as you go method. Thanks for sharing. This tutorial is perfect for the “Quilts For Kids” charity organization that I have volunteered with for the past five or so years. Thanks so much for making this techique “click” for me also! Love all that you do for the quilting community also. Once I complete the first 2 blocks how do I attach the next 2? I have 12 blocks. Is this method just for small projects? You attach the quilted blocks together before adding backing. Then stitch in the ditch. Does this method make the seamed areas extra bulky? No the seams aren’t extra bulky. If you are stitching and flipping you only have one seam. Love this way. Will try it on my next Dresden quilt. You’re going to love QAYG! I loved your QAYG tutorial. I’ve been hesitant to try it because I always bite off more than I can chew. Always!. Watching your video inspired me to try a small size and then expand it, thus allowing my skills to keep up with a project. I would have never thought of that. I’m finishing a behemoth project right now, and my hands, wrists,, arms, neck and back are aching from the moving massive amounts of fabric around to quilt it. I’m also suffering from irregular sized stitches because of the weight of the fabric impeding the even feed. That’s a thin of the past now! I’m certain! Your techniques for demonstrating what to do are excellent–no need to watch the sewing, just follow the simple instructions. Thanks so much! 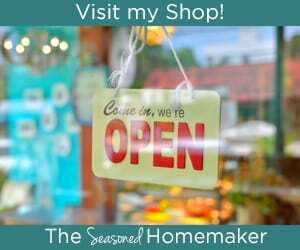 I’m a subscriber to your newsletter and I know I’ll be a regular visitor to your site.